Book: Center StageAuthor: Dannye WilliamsenGenre: PNR/Contemporary Romance/Inspirational RomanceLength: NovelI really don't like to give comparisons when I'm writing reviews, but I make exceptions to that from time to time to get my point across easier. CENTER STAGE by DANNYE WILLIAMSEN is a fantastic book. It reminded me of one of my all-time favorite movies, It's a Wonderful Life, but with an imaginative twist. Can you picture it if Mr. Potter were made to examine his life's choices and how those choices affected others? Sounds like fun, doesn't it?April is a self-absorbed, devious woman who will go to any length to get to the top of the corporate ladder. As the reader is made aware of some of her choices and learns how those choices affected others, you grow to despise this self-absorbed woman. 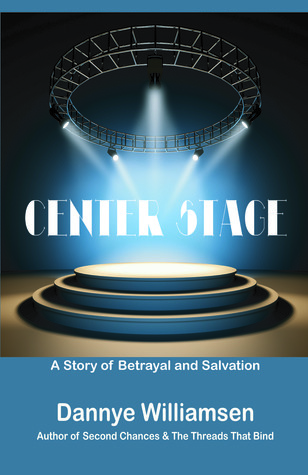 CENTER STAGE is the perfect name for this book, because April strives to be there in the spotlight all alone, at the top of her game without any thought to how her unscrupulous behavior condemns or breaks all those around her, even those who had taken her under their wing and considered her part of their team.The writing in this book is magic, just as with all other books written by Ms. Williamsen. She spins a tail so breathtaking with her words that the reader literally forgets they are reading and feels more like a fly on the wall, watching as each scene progresses and feeling the pain and anguish within the words. My emotions ran the gambit while reading CENTER STAGE. I was filled with anger toward this woman, but by the end of the book, tears were flowing so freely that I was forced to put my Kindle down and regroup before reading the conclusion. Ms. Williamsen has that uncanny ability to make the reader feel empathy for a character that is so unlikeable you just want to beat her with a stick.April is one of those characters that I love to hate, but by the end, I was cheering for her. I'm not going to tell you if things worked out for her or not, because frankly, that was one of the high points in this book for me. It kept me guessing all the way to the last page. I highly recommend CENTER STAGE by DANNYE WILLIAMSEN. I warn you, though, you may be looking at those who hurt you in your past a little differently after reading this novel of a woman being confronted with her past and enlightened to others she has destroyed. "One's Sins Will Come Back to Haunt Us"This is a story which will move you and enthrall you. It's the first novel I've read by noted author/editor, Dannye Williamsen. (So, I hope she forgives me if I make any errors in my review!) It's almost the 4th of July and it's an effort for April Saunders to get out of bed. She recognizes her depression embracing her again, having suffering it for many years. She's been diagnosed as manic-depressive, but has always ignored advice from those who cared about her. She had also been diagnosed as cyclothymic, a mild form of bipolar disorder. At 51 years of age, there is no one who cares about her. Even her ex-husband and daughter are no longer in her life. She has moved from Chicago to a small town, one in which she grew up in, but no one there knows her. Suddenly she hears someone knocking at her door. She's still in her night clothes, but goes to the door and sees a woman offering lovely muffins if April will provide the coffee so they can sit and chat. Grace appears to be a real chatter-box and April has no idea where the conversation is going. However, Grace seems to know all about April's life and can read her thoughts. You might say that Grace is Mary Poppins, sent to April to review her life and give her a final chance to see how selfishly she had been living for decades. Alice is now going to remember all the crossroads of her life where she manipulated people to seek her personal gain. Alice still can change, but will she ever be able to change her memories? This is an awesome story, making one think about one's own life and how we have not always been nice to others. It's never too late to become that better person. A very thoughtful, extraordinary story one I could not put down until the very end, and it's a story which I will remember for a long time. April, the central character in "Center Stage" is the most egocentric, manipulative, downright mean person that you will ever come across. She used people to get ahead with no regard to the ones she was hurting. As a reader, I wanted April to get her just rewards, and she did - but not exactly as I imagined.Grace had the patience of a saint. She was a mysterious visitor who guided April through a review of her misdeeds. The strangely dressed lady actually offered April a chance to undo one facet of her life and change the sad state she was living in now. But April had to choose wisely or things could go from bad to worse.As in all her books, Dannye Williamsen spins a tale that will keep you spellbound until the last page. Her style of writing keeps the reader's interest, setting the stage so you can 'see' what is going on and be a part of the story. I highly recommend this and all of Dannye's books. Dannye Williamsen - Born in Memphis, TN, in 1949, Dannye Williamsen is insightful and innovative in her approach to life, and her writing is designed to share that experience with you. In "Second Chances" and its sequel "The Threads That Bind," as well as in "Center Stage," Dannye offers you characters whose strength and humor in the face of adversity draws you into their world. Her subtle unfolding of the lives of her characters, especially the adversaries, manipulate your emotions until you are no longer able to place them neatly into their predetermined roles. In 2015 Dannye wrote the manuscript for "Chasing Shadows," a Brita Madison Paranormal Mystery and had recently published the second book in the series - "Shattered Hearts." Her first nonfiction work with co-author John Dean Williamsen titled "It's Your Move! Transform Your Dreams From Wishful Thinking To Reality" won a Bronze Award in the 2004 Book of the Year Awards. Through Williamsen Publications, she offers nonfiction books and CDs to help you appreciate who you really are; apply what you learn to your day-to-day experiences; and finally, just experience the joy of change. Her nonfiction writings seek to provide information that not only helps you balance your physical, emotional and intellectual centers, but helps you develop a conscious awareness of your use of them. Her business background in management ranges from land investment to commodity trading to her own entrepreneurial ventures, experiences which she uses in her two novels. Dannye Williamsen has always sought diversity and excellence in her life, which has resulted in her being named to Marquis' Who's Who in America™, Who's Who in the World™, and Who's Who of American Women™ since 2002, and in 2009 to Who's Who in Finance and Business™. She extends that effort into her search for spiritual understanding and her writing.